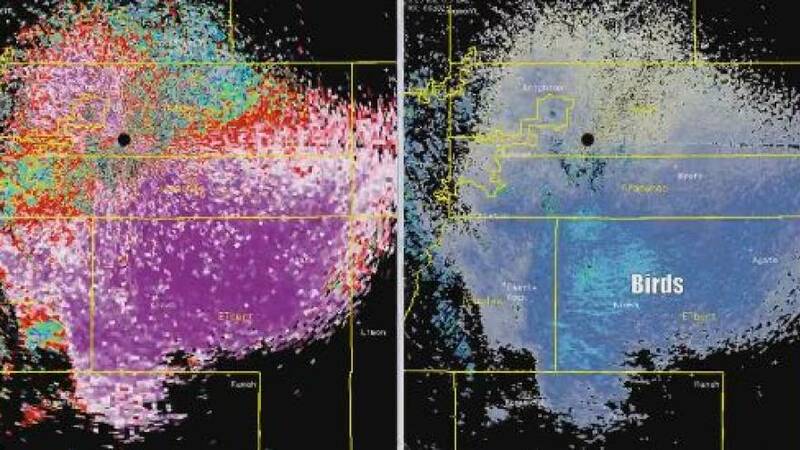 A colourful, shimmering pattern detected by a weather radar over the US which left experts mystified has been identified as a swarm of migrating butterflies. Scientists at the National Weather Service (NWS) first mistook the multi-coloured blob in the state of Colorado for flocks of birds. After taking to social media to find out more, forecasters later confirmed that the 110km- wide mass was a kaleidoscope of painted lady butterflies. Weather experts say that while migrating birds are often detected by weather radars, it is rare for flying insects to show up on their screens. This direction of travel is unusual for migratory birds at this time of year, so the puzzled weather expert took to Twitter to identify the species. His question was answered after members of the public reported sightings of butterflies drifting with the wind across the area. The painted lady, a large colourful butterfly known for its orange and black-spotted wings, has been spotted in unusually large numbers in the Denver area in recent weeks. The colours on the radar image are a result of the butterflies’ shape and direction rather than their colourful wings. The species is found across the US and travels to the southwest and northern Mexico during colder months. Painted lady butterflies are also known for following wind patterns and can glide hundreds of kilometres each day.